For the second year in a row, William & Mary Law School graduates have helped provide justice to millions of Cambodians. After graduating in 2016, Meghan Phillips and Rosemary Hambright packed their bags and traveled to Phnom Penh, the capital city of Cambodia. From September 2016 to January 2017, they worked for the Extraordinary Chambers in the Courts of Cambodia (ECCC), which is a hybrid tribunal that was set up by the United Nations in 2001 and operates within the Cambodian judiciary. The tribunal was established to investigate and try cases stemming from the Cambodian genocide. During the genocide, which lasted from 1975 and 1979, between 1.5 and 3 million Cambodians were killed at the hands of the Khmer Rouge regime. Moving to a foreign country to prosecute a genocide has a unique set of challenges. But both Meghan and Rosemary were ready for it. Both had previously lived abroad, and the Law School helped them pursue international internships. Meghan grew up in a military family and her father was deployed to Iraq. As an undergraduate student at the University of Notre Dame, she majored in political science and French and studied abroad in Paris. Rosemary attended Washington & Lee University, where she double-majored in environmental studies and English and studied abroad in Italy and Brazil. After graduating, she taught English for two years in South Korea. While in law school, both alumnae interned abroad through the Law School’s Center for Comparative Legal Studies and Post-Conflict Peacebuilding (CLS/PCP). Meghan spent her 1L summer in South Africa and worked for People Against Suffering, Oppression, and Poverty, a non-profit organization that helps asylum-seekers, refugees, and immigrants in the country. Rosemary spent her 1L summer in Cambodia and worked for International Bridges to Justice, a non-profit organization that seeks to protect the rights of criminal defendants in developing countries. Professor Christie S. Warren, the director of CLS/PCP, said that both women took courses in International and Comparative Law and Post-Conflict Justice. In addition, they were very involved in both the International Law Society and CLS/PCP. “They were both excellent students and deeply interested in international law and transitional justice,” she said. Their interest and background significantly helped them when working at the ECCC. 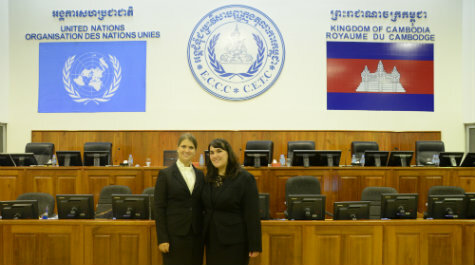 Meghan and Rosemary worked for the Office of Co-Investigating Judges, which consists of a Cambodian and a non-Cambodian judge. Both judges are responsible for conducting pre-trial investigations into defendants. Currently, the tribunal is focusing on Cases 003 and 004. Both Meghan and Rosemary worked for the same supervisor and the same judge – Judge Michael Bohlander, the office’s non-Cambodian judge. As a result, they worked on similar projects and often helped each other out. Meghan said that working in a different judicial system posed unique opportunities and difficulties. Although the judges are responsible for investigating, prosecutors and defense attorneys can request that judges interview certain people or include certain facts. The judges must rule on a variety of procedural motions, including on the question of whether to grant such requests. Among other tasks, Meghan and Rosemary were responsible for drafting decisions. “The ECCC really helped me with my drafting abilities and exposed me to the inner workings of complex litigation,” Rosemary said. For her, one of the job’s greatest challenges was the subject matter that she was working on. Both said they enjoyed living in Phnom Penh, the Cambodian capital city. “It is very different from living in the U.S., but there is a lot of beautiful history in Cambodia,” Meghan said. She especially enjoyed visiting Angkor Wat, which was built in the 12th century and is the world’s largest religious monument. Rosemary said that the city had a very vibrant expatriate community. When she wasn’t working, she volunteered for Phnom Penh Players, a group that puts on theatrical productions in the area, by helping them advertise their shows. 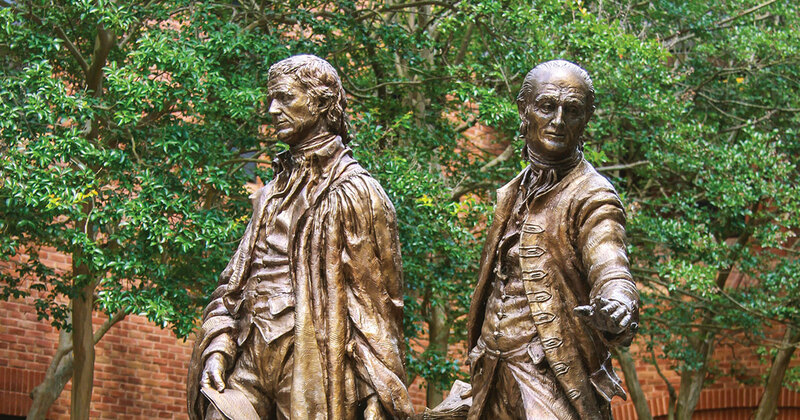 Meghan and Rosemary are not the first William & Mary Law School graduates to work at the ECCC. In 2015, both Steffanie Garrett J.D. ’91 and Fahimeh Manjili J.D. ‘15 received fellowships to work at the tribunal. While international law sounds like an exciting field to enter, it is also a challenging one. Jobs can be difficult to come by, and many tribunals are starting to wind down. This means that strong connections to tribunals play a crucial role in obtaining a position. “Through our extensive contacts with international organizations, assistance of our strong alumni network, financial assistance from individual alums and past interns, and unwavering support from the Law School administration, we have been able to prepare students for prestigious and meaningful careers that deal either directly or tangentially in international legal issues,” she added. The Office of Career Services paid for half of Rosemary and Meghan’s fellowship stipends, while CLS/PCP funded the other half. In addition to fellowships, the Law School also supports students who want to study abroad through the CLS/PCP’s International Internship Program. According to Professor Warren, the program has placed 155 students in international internships since 2002. This includes Meghan and Rosemary, who both interned abroad while in law school. These placements can provide students with global connections that can significantly help students down the road. “This was an extraordinary opportunity for me to develop academically and professionally,” Rosemary said. “The head of my team had been working on international criminal law for most of his career, and there were interns from all over the world.” She currently serves on the Advisory Council of the State Bar of Texas' International Law Section as well as its International Human Rights Committee. “I think it was a wonderful postgraduate experience, and I am really grateful for the help that William & Mary and Professor Warren provided me,” Meghan said. “There aren’t a lot of opportunities to work in this field, and it was a wonderful chance to work in a post-conflict country.” In October, Meghan will begin her studies toward an LL.M. degree in public international law at the School of Law at Queen Mary University of London as the Law School’s 2017-18 Drapers’ Scholar.